Thought I'd revisit Leapmoor forest and Cornalees today, up near Inverkip, so put the bike on the car and headed up to Lunderston Bay parking. The beach track to Kip is improved, someone has removed some dense bushes that blocked the path. 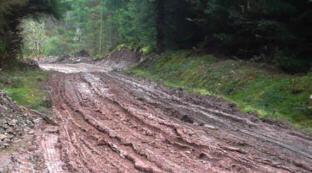 Went into Leapmoor via Everton, a scout hut, nice trail for downhill, unfortunately the opposite way to my direction. The Leapmoor track was disgustingly muddy, but had only about 1km of it before going down past Langhill then up to Cornalees. The Kelly cut wasn't too bad, the disc brakes helped, they don't get all clogged up like the V brakes. Finished along the muddy track to Finnock Bog farm and back along the beach. Very nice, apart from loads of mud and loads of thorns, seems the farmers have been out en mass flailing their hedges. View todays pictures here and the route here.